Art-deco doors have never gone out of style, although the movement peaked in popularity during 1930s America. 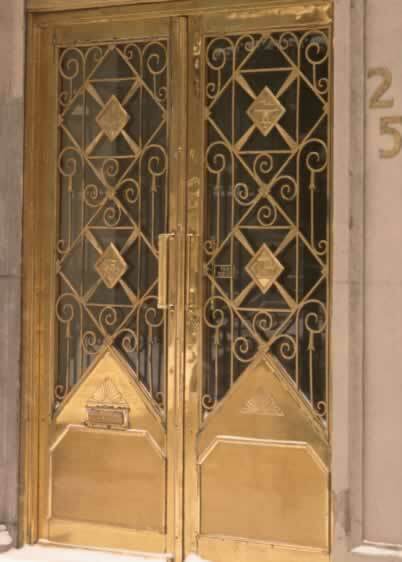 Visit every major American city and you'll see well maintained original or restoration examples of copper and brass doors with angular, intersecting angles within their frames. Appreciation of these period doors rose to new interest during the late 1960s and continues to flourish in aluminum, steel, lacquer, and copper varieties. What a fantastic way to adorn a period deco, craftsman, or contemporary home. The pictured doors have the essential touches, including sunburst kick-panels and ornaments, open, glass-backed diagonal patterns, and vertical door handles. The double-leaf metal doors can be adjusted for single or double-door operation. If you're restoring a metal door like this, it's good to know that manufacturers still create back-plates, escutcheons, and rosettes in a range of materials designed to complement the era.